A visit to India Cook House, an Indian restaurant in Irvine, has been long overdue by me. After all, I drive past it on a daily basis, and I have heard a lot of good remarks about it on Chowhound. We arrived on the early evening to an almost empty restaurant. The room was larger than I expected, with a dramatically lit white stone fountain on the far wall. A few cushy booths hugged one side of the restaurant, while square tables dressed with white cloths occupied the rest of the space. We ordered the Chicken Tikka Masala ($11.95), which was described on the menu as "All white meat boneless chicken marinated in spices and yogurt, tandoored in clay oven, then blended in our delicious curry sauce" and the Shrimp Jalfrezi ($12.95), which was "juicy shrimp cooked with assorted vegetables". We also ordered Naan bread ($1.50). The first thing that was brought out was the papadum. These, for those who've never had them, are thin crispy Indian crackers, which are served with a spicy mint chutney and a sweet mango chutney. The papadum were light and airy, perfect with a dab of the marmalade-like, sticky consistency of the mango chutney and the piquant heat of the mint chutney. Then the dishes were served, all in shiny metal bowls. The Chicken Tikka Masala was fantastic. It is quite simply, the best that I have ever tasted. The sauce was the star of the dish. Deep reddish orange, it was creamy and rich. Eaten with rice, each spoonful of it filled my mouth with the faint sweetness of tomatoes, the silkiness of coconut milk (or was it yogurt), and the ever present tang of spices. It was not overly sharp or too bold. Just perfect. The chicken meat was really just playing second fiddle to the sauce. The Naan, which is Indian flatbeard baked in a tandoor oven, was also surprisingly bubbly, crispy, and yet still supple. It's somewhere between a matzo cracker and a thin pizza dough crust. Perfect when dipped into the aforementioned Tikka Masala sauce. The Shrimp Jalfrezi was also good, but not a favorite. The shrimp, completely stripped of the shell and tail were quite large and plump. They could have been cooked a little less, since some were a little rubbery. And the accompanying sauce was quite mild and was more akin to a vegetable soup that an actual sauce. The veggies (potatoes, carrots, zucchini) were a nice addition, rounding out our meal nicely, but I don't think you could order the Shrimp Jalfrezi all by itself and feel satisfied that you had experienced all the flavors the restaurant had to offer. In any case, a great meal, and a stone's throw from home no less. By the time we were finished with our meal, the restaurant had filled up completely. Dozens of people, Indians included. This place has become my favorite restaurant in O.C. for good food, presentation, and price. This is probably the third time I reviewed this place for Chowhound, and the umpteenth time I've eaten there. We were there on Friday and had a reservation at 7, but came late. About thirty minutes late. Unfortunately that was late enough that they gave our table away. But I thought that was fair. People with 7:30 reservations, who arrived on time, got seated right away. It's nice that reservations actually mean something here. We waited an extra 10 minutes before an unreserved table opened up. We were given this table before another couple, who came before us but didn't have a reservation. Their system worked nicely, I thought. The couple in front of us got their seats shortly afterward. A busy night, but the wait staff kept everyone happy. We ordered one entree off the specials menu and one from the regular menu. The special entree for that night was SAUTEED MONKFISH WITH GARLIC RISOTTO AND SUNDRIED TOMATO ($15.00). We also ordered the OSSO BUCCO ($15.00). The entrees came with their wonderful and creamy SWEET POTATO SOUP, which was light adobe red, and piping hot. A GREEN SALAD WITH GINGER MISO DRESSING came out afterward. Fresh greens, a spicy dressing, perfect for priming the tastebuds for the entrees. The monkfish was alright. The white flesh was cooked just right, but lacked much flavor. The freakish giant bone that held the meat together was a little scary. This, as you might have guessed, was the first time we've had monkfish. The risotto was cooked correctly, but in my opinion, wasn't as creamy or full bodied as their usual mushroom risotto. My favorite fish dish there is still the Salmon Saiko. The osso bucco was dreamy, as always. We love this dish. A big hunk of falling apart tender beef, in a pool of dark gravy (or is it a reduction). It came with a separate side of roasted potatoes and corn nibblets. The beef was perfect, eaten with white rice. I've heard some people comment that this dish was too salty for them, or too overcooked and soft, but for my money, this was the dish. Loved it! The highlight of the meal was the special dessert of the night. 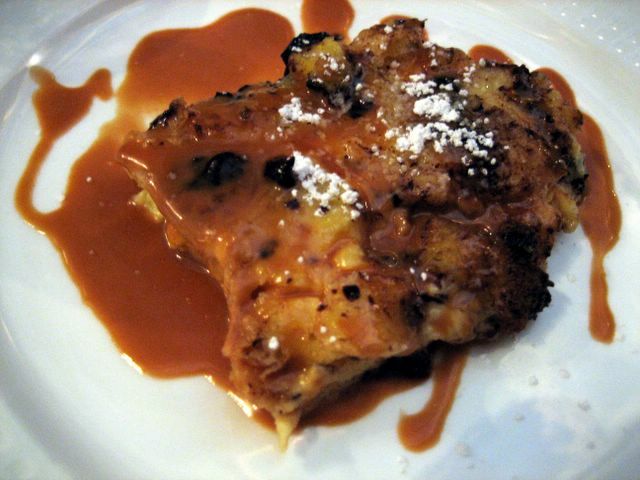 CROISSANT BREAD PUDDING WITH CARAMEL SAUCE AND CHOCOLATE ($5). This simply is the best dessert I've ever had, anywhere! I hope they put it on the regular menu. It came on a large plate. A mound of warm, brown bread pudding, drizzled with caramel sauce and studded with melted chocolate chips. The combination of flavors just kind of melted in your mouth and filled your senses. Simple in origin, but elegant in flavor. Sinful but suprisingly not heavy. We also ordered a GREEN TEA BLANC MANGER ($4.00). And it was just as good as always, but since we tasted the bread pudding first, it's now relagated to our second favorite dessert at Cafe Hiro. P.S. I found some cool looking photos a fellow diner took on a recent visit to Cafe Hiro.